WinModelines is a Windows tool to tune the video signal generated by your computer video card. It allows you to adjust line and frame frequency for special monitors or televisions, picture borders and create custom resolutions for optimal video and game playback. if you already have some useful modelines you can just copy, paste and set them easily. You can find useful modelines in Useful modelines tutorial or other sources on the web. AMD-ATI: Catalyst drivers, all versions supported including some old Pre-Catalyst drivers. Tested on: Windows 95, 98, 2000, XP and 7. It could work on other Windows versions. NVidia: ForceWare drivers supported starting in version 61.x (without interlacing) or 66.x or newer (with interlacing), compatible only with Windows XP drivers. We managed to make it work on Windows Vista/7 forcing the install of Windows XP driver. The XP driver must be extracted from the installer and then installed from the device manager. Intel: GMA900 and later models. Tested on: Windows XP, 7, 8 y 10. All Intel cards seem to have a limitation where pixel clock cannot be set below 20 MHz. Low line frequency modes (15kHz etc) can be used increasing their horizontal resolution so the pixel clock remains above 20 MHz. Matrox: driver version 5.33 or 5.82. Tested on: Windows XP. 3Dfx: version 3 or newer. Tested on: Windows XP. ArcadeVGA: Catalyst version 4.3. Tested on: Windows XP. modeline editor redesigned for easier use and better features. It will guess the device that a mode belongs to and calculate its original borders. It will also hide advanced settings that could cause confusion. settings "Show advanced settings", "Exact refresh" and "Even lines" kept on program exit. added command line parameters support. This allows the automation of mode insertion and test. WinModelines is a program designed and programmed by Jeroni Paul and is freely distributed under the GPL licence. Project completed on June 2007 by Jeroni Paul. 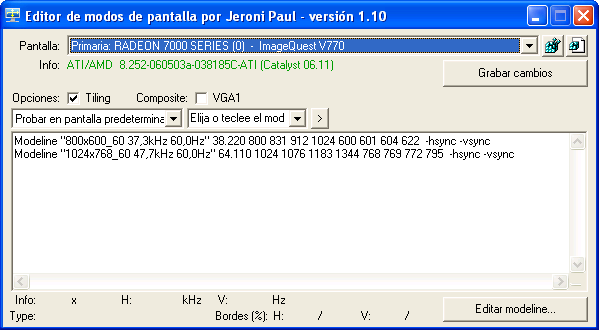 Copyright © 2007 Jeroni Paul.